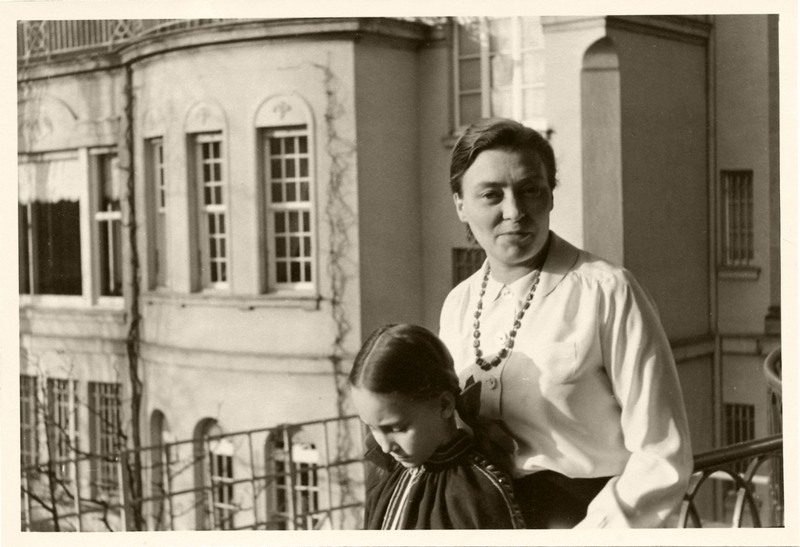 Elfriede Höber and Susanne Höber on the balcony of their apartment at Pempelforterstrasse 42, Düsseldorf, December 1938. World War II began with Hitler’s invasion of Poland on September 1, 1939. My mother, Elfriede, and my 9 year old sister, Susanne, were living in Dusseldorf and getting stuck in Nazi Germany became an all-too-real possibility for them. It was imperative that they get away and join my father, who had fled to Philadelphia the previous year. The war had started just a few weeks after the American consul had granted Elfriede and Susanne immigration visas after months of struggling. Then, getting the household packed up, wrapping up their business, and saying farewell to family and friends took weeks — and suddenly it was almost too late. 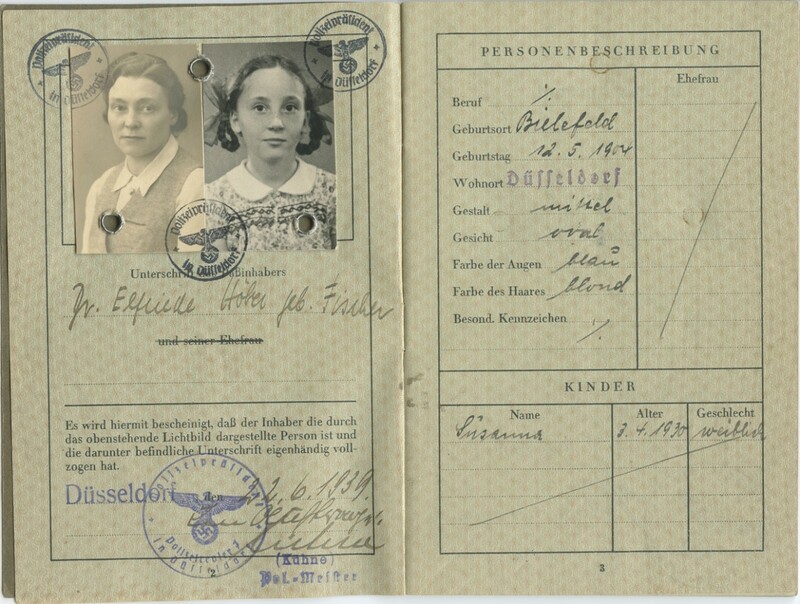 German Passport issued to Elfriede Fischer Höber and Susanne Höber, Düsseldorf, June 22, 1939. The start of the war only increased the flood of emigrants racing to escape Europe. 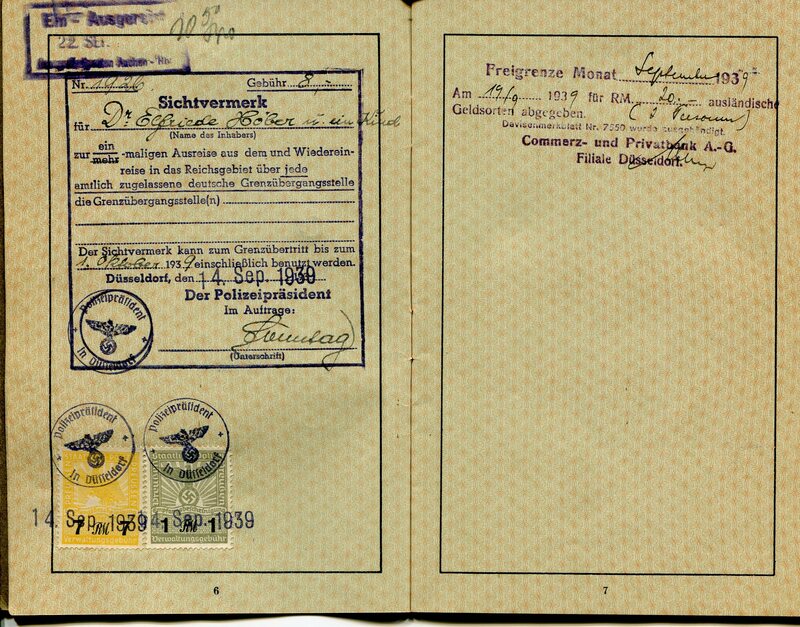 The stamps in Elfriede’s passport show that on September 14 she paid the German government 8 Reichsmarks for an exit permit. On September 19 she obtained a bank certification for the 20 Reichsmarks (about $10), the total that she was allowed to take out of Germany. Thankfully, on September 22 at 8:50 P.M. she and Susanne crossed the border at Aachen out of Germany and into Belgium. They arrived in Antwerp the same day, where they were supposed to board a ship for America. But it wasn’t that simple. Stamps in Elfriede and Susanne’s passport show their exit permit, fiscal authorization and crossing of the border into Belgium, September 1939. If heaven and assorted Führers don’t spit in our soup again, we’ll be with you in a couple of weeks. 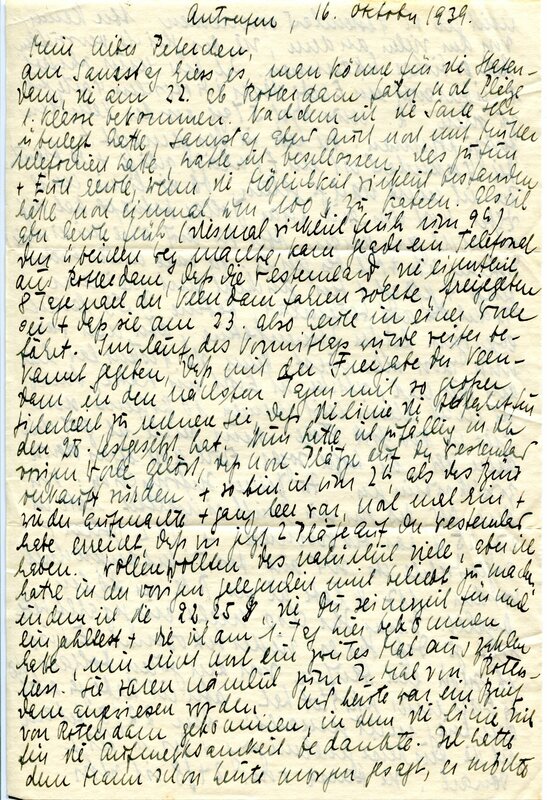 Letter from Elfriede Höber in Antwerp to Johannes Höber in Philadelphia, October 16, 1939. The story of what happened next, and more about Elfriede and Johannes’ flight from Germany to the United States, is contained the book from which this story is taken: Against Time: Letters from Nazi Germany, 1938-1939, available by clicking here. Growing up, my father had no reason to think of himself as Jewish. He was baptized and confirmed in a Protestant church, his father was baptized and confirmed in a Protestant church and his father’s parents were married in a Protestant church in 1865. My father’s mother had been born into a Jewish family but converted to Protestant when she was a teenager. By the time my father was grown, his family lived an entirely secular life. They rarely if ever attended church, though they celebrated the holidays of the Christian calendar. 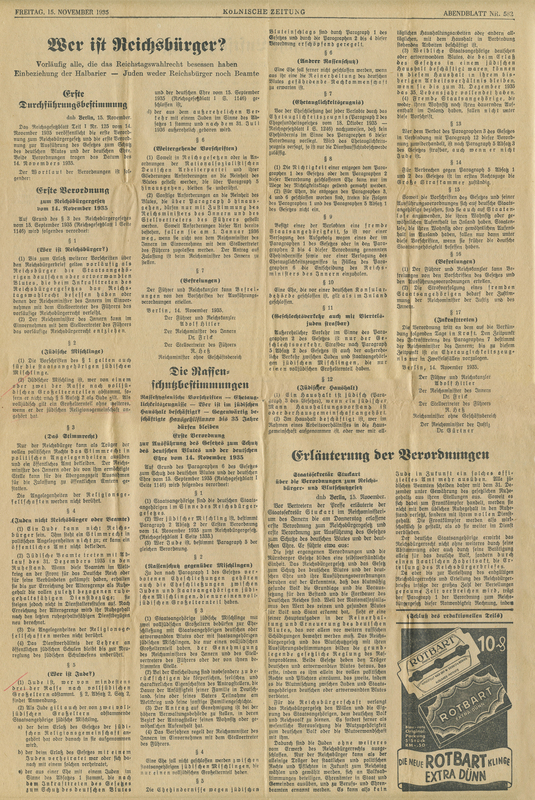 Several years ago, I found a newspaper clipping pertaining to the antisemitic Nuremberg laws among the papers of my grandfather, Rudolf Höber. Rudolf came to Philadelphia from Nazi Germany in 1933 as a professor at the University of Pennsylvania. Two years later, my father, Johannes, sent Rudolf this clipping from Germany. The article, captioned “Who is a Citizen?” was clipped from the Kölnische Zeitung (Cologne Daily) of November 15, 1935. The article is the first publication of the implementing regulations for the Nuremberg laws, which stripped German Jews of their citizenship. When Rudolf and his wife Josephine had left Germany, Johannes had stayed behind in Düsseldorf with my mother and sister. In the letter my father asked his father, Rudolf, for information about Rudolf’s father, Anselm. Was there any possibility that Grandfather Anselm, who died before Johannes was born, had Jewish origins that could have an impact on Johannes? 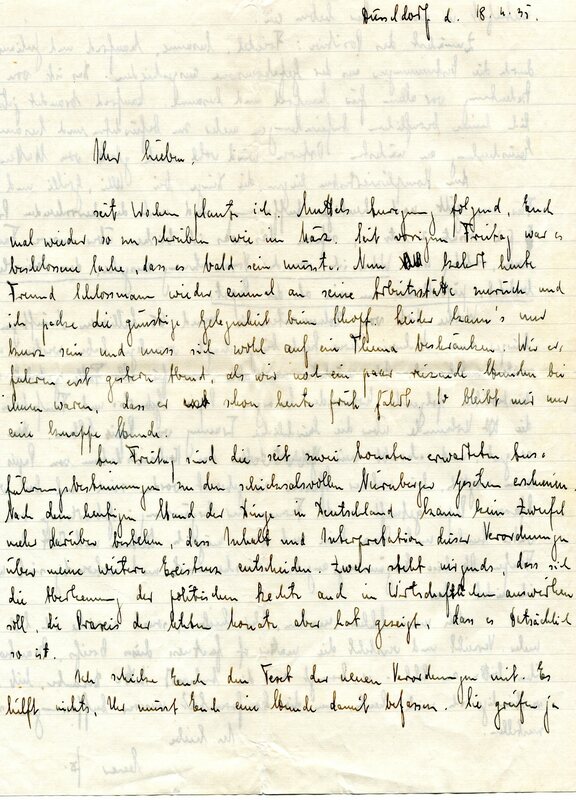 Letter from Johannes Höber in Düsseldorf to his father, Rudolf, in Philadelphia, November 18, 1935. Johannes asks his father about his grandfather Anselm’s Jewish origins. My father’s status as a Christian or as a nonbeliever was irrelevant to Adolf Hitler and the National Socialists. The Nazis considered Jewishness a “race,” an inheritable genetic trait separate and apart from the religion. Their laws defined a person as “Jewish” if he or she had three grandparents who came from Jewish families. Under that definition, hundreds of thousands of Germans who regarded themselves as Christians or nonbelievers were brutally persecuted by the Nazis as “Jews.” Individuals of mixed Jewish and non-Jewish ancestry were sometimes subject to less harsh treatment, but the administration of this purported legal structure was capricious– a bureaucrat’s guess at interpreting the code could mean the difference between life and death. Many scholars of the Nazi period today put the term “Jewish” in quotation marks when writing about individuals subject to these codes in order to distinguish between those defined as Jewish by the Nazis and those who used other criteria to identify themselves. 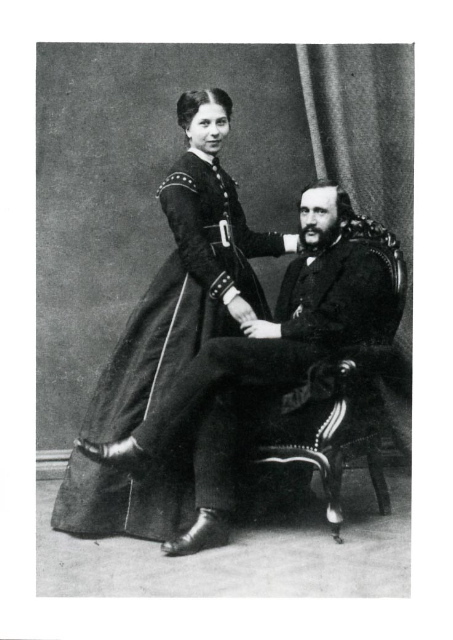 My great grandparents, Anselm Höber (1832-1899) and Elise Köhlau Höber (1843-1920), around the time of their marriage in 1865. A century after Anselm was born, the question of whether his parents were Jewish would have major implications for his grandchildren and great grandchildren. I became aware of all this only years after my father died. My parents were refugees from Hitler’s Germany and I understood them to have left because it was impossible for them, as Social Democrats, to live under Hitler’s inhuman regime. This letter and newspaper clipping show, however, that my father had also faced danger from the Nazis because of his grandfather’s Jewish ancestry. In my father’s letter to his father, he asked for information about Anselm. Under the crazy calculus of the Nuremberg laws, the birth certificate of the grandfather my father never knew might have been of crucial significance for his own future. My grandfather’s response to my father was not among the papers that my family was able to preserve. My father probably left it behind in Germany when he came to the United States three years later. Suffice it to say that my father continued to live the secular life he always had and managed to avoid any situation in which the question of his grandfather’s Jewish birth might arise. He was thus able to evade the brutal consequences of being deemed a Jew in Nazi Germany. Readers of the posts on this website may recognize that I have subsequently discovered a great deal about my family’s Jewish origins. Much of that would have come as a complete surprise to my father.